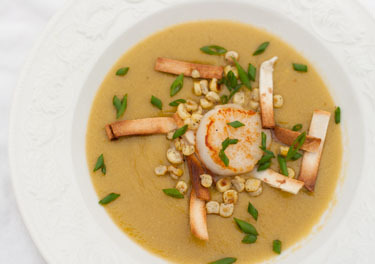 I created this soup for my “Cooking Basics” series. Using your pepper roasting skills (see Cooking Basics – Roasting a Chili Pepper), you can make this great dairy-free and gluten-free soup for dinner. 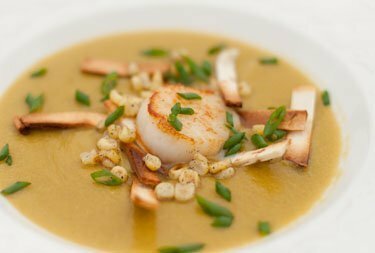 You can leave it as a simple comforting creamy soup, or gussy it up by topping it with seared scallops or crab meat and fresh veggies. Or, you could do a make-your-own soup night by putting out bowls of all kinds of fun stuff to top the soup. Garnishes can include: Sour cream, chopped cilantro, sliced green onions, avocado, shredded pepper jack cheese, shredded chicken, seared scallops, salsa, more roasted peppers. Or, use whatever your imagination can come up with. Preheat oven or the toaster oven to 400°. 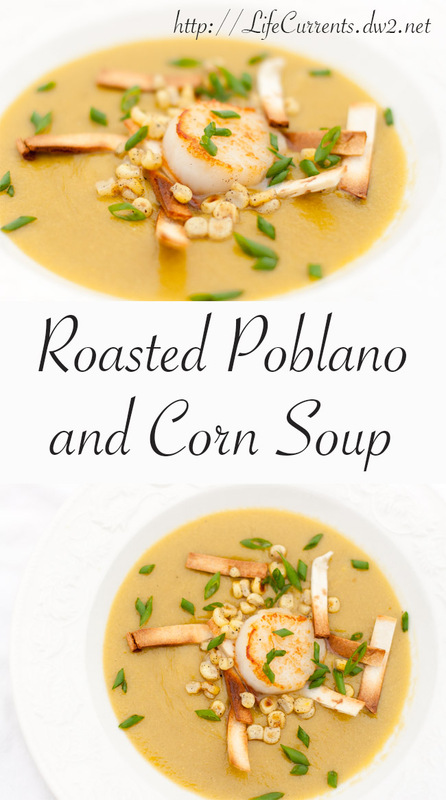 Roast the poblano chili and the yellow pepper. Slice the roasted peppers into ¼ inch slices. In a medium saucepan, heat the olive oil over medium heat. Add the onion and cook, stirring often, until caramelized and golden brown, about 15 minutes. Add garlic and cook for 1 minute until garlic becomes fragrant. Transfer onion and garlic to a blender. Add the corn to the same saucepan, and cook over medium heat until corn begins to toast and turn golden, about 10 minutes. Transfer the toasted corn to the blender. To the onion and corn in the blender, add the masa and about 1 cup of the broth. Carefully blend the onion mixture until smooth, adding more broth if necessary. (I like to place a towel over the covered blender to catch any spills that might come out the top of the blender when you turn it on. The towel has totally saved me on more than one occasion!). Pour the blended soup back into the same saucepan. Add the roasted peppers and the remaining broth to the blender, and process until smooth. Add the blended peppers to the blended onion mixture and stir. Heat the soup over medium heat until boiling. Turn the heat down to low and simmer, stirring frequently for 10 minutes. Meanwhile, cut the tortillas into ¼ x 2-inch strips. Spread the strips out on a baking sheet and bake uncovered until lightly browned and toasted, about 5-10 minutes. Taste the soup for seasoning, adding more salt if desired. Also, if the soup is too thick, add some water or more broth to thin it to the desired consistency. Ladle the soup into bowls and top with toasted tortillas and any garnishes desired. Enjoy.